Modulus refers to the ratio of stress (force per unit area) along an axis to strain (ratio of deformation over initial length) along that axis. This is often referred to as work to rupture. Stretching a rubber band to the point where it breaks is a great example of modulus. A rubber band is low modulus where high modulus requires a considerable amount of force to make an impact on the fiber’s original shape. It is important to understand that when industrial thread and yarn stretch to the point of deformation, the strength is almost always compromised. In wire and cable applications, you don’t necessarily need a high modulus material for ripcords of binders, however, a high modulus aramid yarn is most often the best choice to use for strength members. When a wire or cable is put under a number of different environmental stresses, the force should be absorbed by the strength member yarn, rather than putting the optical fibers or conductors at risk for becoming damaged. High modulus reinforcement yarn can also minimize cable diameter and weight, while increasing resistance to deformation. One of the most common aramid fibers is Kevlar®; however®, there are many alternatives that feature an excellent combination of high modulus characteristics, low density and high electrical resistance. Fiber optics and aerial cables are oftentimes required to sustain a high level of environmental stress including wind and other elements that impact the wear and tear of a cable. Whether its environmental stress or other elements that place a static and constant load, using a high modulus aramid yarn as a strength member is the best option to ensure wire and cable longevity. Pound for pound, high modulus aramid yarns are five times stronger than steel. A less bulky thread or yarn does not necessarily mean the fibers will be lacking strength. Additionally, you’ll get more yards per ounce with a lighter weight thread or yarn. Even thread with a lower denier can possess the strength needed for industrial strength member yarns for many applications. It is recommended that you work with a knowledgeable industrial thread and yarn partner to select the high modulus aramid that best fits your needs. As mentioned above, fiber optic cables are exposed to a number of environmental factors where temperature may play a critical role. Heat can degrade fibers depending on fiber type, conditions and time of exposure. Aramid yarns have no melting point (they decompose), are resistant to thermal degradation, feature low flammability, and offer sustained stability over a wide range of temperatures and friction levels. Creep refers to a time-related, non-recoverable damage or increase in length when an industrial thread or yarn is subjected to a sustained stress. 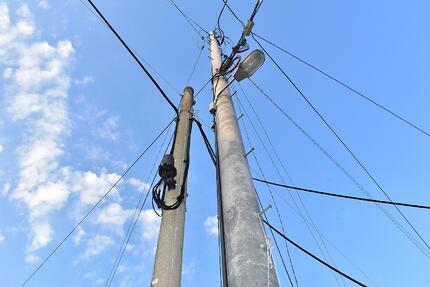 In aerial installations, wires are often pulled tight and kept under a constant tension. Eventually the wire will begin to sag because the fiber reinforcement won’t be able to maintain to its original shape – this is an example of creep. Fatigue is when a material weakens due to repeatedly applied loads. Think about when you rock a drink tab on a can back and forth. Eventually, the stress will weaken the material to the point in which it breaks. Fatigue inducing loads can come from many sources, whether it’s the movement of the tides in an ocean application, wind guest from an aerial application, or mechanical movement in a cable that is controlling a piece of machinery. High modulus materials, especially aramids, have a higher overall resistance to creep and fatigue. Are you looking for the best yarn for your wire and cable application? Learn how Service Thread helps wire and cable partners improve their products and services.